Good news! 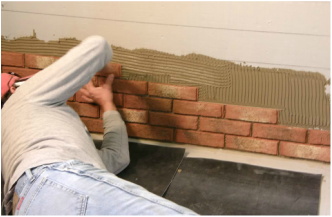 Here is a DIY guide to install our brick tiles. Even if you've never installed tiles before, you can do it yourself with a little patience, a few equipment rentals and the right supplies. Your builder or local tile installer will also have no trouble - Inglenook thin brick pavers are installed like any other ceramic tile, according to ANSI guidelines. Basic steps for the installation process are listed below. If you've never installed tiles, we also suggest you use the Tile Council of America Handbook for Ceramic, Glass, and Stone Tile Installation as a guide. Regan Woods floor in progress! 1. Install mortar, set and grout tile when surface temperature is a minimum of 50 degrees F, and a maximum of 90 degrees F.
2. Be sure surfaces are stable, level and plumb, clean (with no debris), dry and free of waxes or oils before installing your thin brick tile. We figure a thin 1/4" grout line between the tiles, but you can lay them as you wish. 3. For wall applications, we recommend thin-set, stone mastic or construction adhesive over sound substrate. Pressed wood, particle board, gypsum-based patching compounds and other dimensionally unstable material should not be used as substrates without a firming material over it. Installation of tile should be over stable substrate, such as, Portland cement mortar bed or Portland cement backer board, or poured-in-place concrete. ANSI A137.1 (Ceramic Tile), ANSI A136.1 (organic adhesives), ANSI A118.1 (dry-set Portland cement mortar), ANSI A118.4 (latex Portland cement mortar), ANSI A118.7 (ceramic tile grouts, latex modified), ANSI 108.1 (installation with wire reinforced mortar bed), ANSI A108.4 (installation with organic adhesives), ANSI A108.5 (installation with dry-set or latex Portland cement mortar, and ANSI A108.10 (installation of grout). 5. Polymer-modified grout is recommended. 6. Cure set tile 72 hours, traffic-free, before grouting when in cool temperatures and with high humidity. In hot and dry conditions, cure 48 hours, traffic-free. 7. 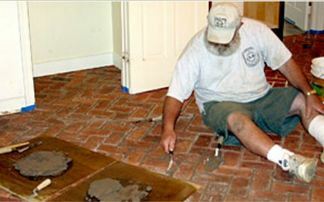 Regarding installation methods, Inglenook Tile does not endorse one method over another, as each has its uses. It is the responsibility of the specifier or installer to determine the appropriate method for a given job. The Tile Council of America Handbook For Ceramic Tile Installation should be used as a guide for a given situation. 8. Be sure expansion joints, insulation joints, control joints, etc., are located in compliance with TCA EJ171, and filled with appropriate materials. 9. You might choose to seal thin brick tile before grouting to protect from staining. It can also help as a grout release, but no sealer is going to completely prevent a haze. You can either remove it with a commercial haze remover, a dilute muriatic acid wash. If you want a matte finish, a color-enhancing penetrating sealer like Aqua Mix Enrich N Seal will make that haze go away and seal at the same time. How you grout will affect the amount of haze left on the surface. You are always welcome to call with questions. You can also check our blog post at inglenooktile.wordpress.com for further instructions on installing our tiles. AquaMix carries a variety of products suitable for sealing and protecting your tiles. www.aquamix.com to find a dealer near you. Enrich 'N Seal: this is a non-strippable polymer penetrating sealer that will also darken the tile surface slightly. It acts as an excellent sealer for areas where no shine is wanted. No surface coat of an another product will adhere to the surface. Sealers Choice Gold: this is a premium strippable water-based penetrating sealer. It will not change the surface color or texture. This is a good sealer resisting water, dirt and oil. High Gloss Floor Shine and Hardener: this is a high gloss sealer that can be applied over the Sealers Choice Gold, if a shine is wanted after installation. Seal and Finish, Low Sheen: this is an attractive a low gloss sealer. Surfaceguard Penetrating Sealer: this sealer does not alter the surface color or texture. Matte Sealer and Finish: this can be applied in as many coats as desired over the Surfaceguard Penetrating Sealer to provide a low gloss. High Gloss Sealer and Finish: this is used in the same way as the Matte Sealer, but with a hard shine. Paste wax is beautiful over any of the non-penetrating sealers. Apply in several thin coats with a stiff brush, let dry and then buff with a soft shoe brush. Laticrete makes a variety of thin-set adhesives for tile and stone. #255 Multimax is best to use on walls and ceilings for maximum strength. 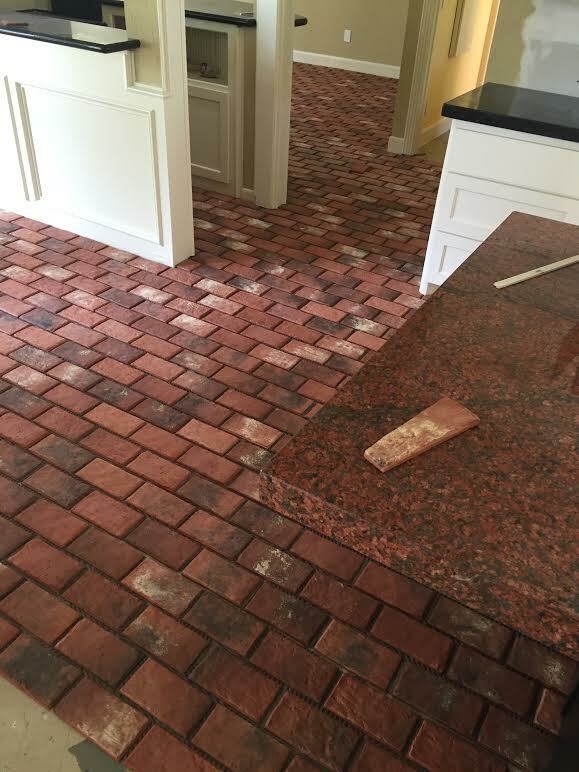 Any thin-set adhesive that is used for tile is fine for Inglenook brick tiles. We suggest a non-sagging adhesive for walls. Please note: Inglenook Brick Tiles have variations in color and surface texture in order to achieve an authentic antique appearance. This is to be expected, and is not a defect. Limited Warranty and Disclaimer: The manufacturer warrants these products to be merchantable quality and will replace any defective product. As always, check your shipment when it arrives. Any shipping damage should be reported within seven (7) days from date of delivery.